Mildred Webster, the official family “correspondent,” starts off the New Year of 1947 with a full report on Christmas activities in the camps, hopes for the family’s first home leave later in the year, and observations about her husband’s “playing” the Roupee market in Bahrain. Then, inexplicably, letters from the next two months are missing – lost in transit to the United States and, presumably, never received by family members. (This is later attributed to boat mail losses compounded by the still less-than-normal transportation situation in war-torn Europe and bad weather in New York City during the winter). 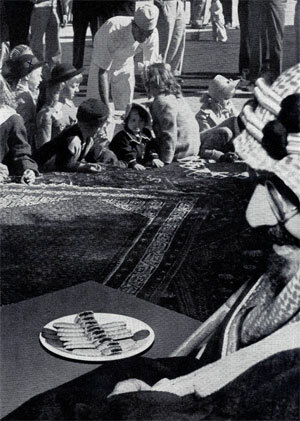 During the two-month gap in the letters, King Ibn Saud visits the Aramco camps with an enormous entourage, resulting in international media coverage, including a spread in Life magazine. Mildred celebrates her first anniversary in Arabia, Aramco’s huge investment in the area really begins to take off, Ken Webster receives a big promotion to help oversee (and spend tens of millions of dollars on) all company construction, engineering and communications in Arabia, the unique partnership between Aramco and the Saudi Royal Family begins to reap major rewards in terms of oil production and profits, and the camps continue to flourish. This chapter covers January to March 1947. 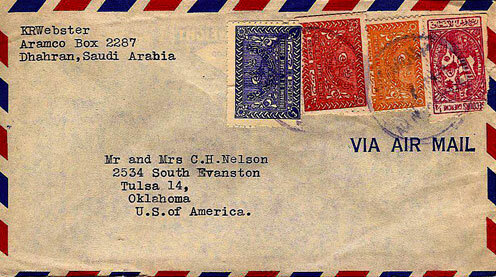 One of hundreds of airmail envelopes containing lengthy letters to Stateside family members during the Webster Family’s many years in Saudi Arabia. This one is addressed to Mildred Webster’s father and stepmother in Tulsa, Oklahoma. I hurried a letter out the other day with a friend going home…didn’t have a chance to say much. You do know by now, though, that we received the (Christmas) boxes – late, but they did get here. In a way it was even more fun that way, for we had two Christmases . . . thanks for all the lovely gifts. Ken was delighted with his and so was I. The girls were, too, and got such a kick out of them all. We really had a picnic opening all the things. I must confess, though, that I held a few things back for the girls – to be used for birthday presents and also held out some of the funny books – they got so many and that way it scatters them out. Our house is the most popular in camp – the kids just swarm in here and sprawl themselves on the children’s beds and floor and then there is complete silence for hours . . .
All in all, it was a most busy time and packed full. The Sunday School, which is conducted in one of the homes by three of the mothers, had a lovely Vesper Service and later a truly fine tree and a gorgeous Santa – I had some things in reserve and had brought all my decorations, so we managed fine. We were able to get a bike for Judy – a boy’s bike, but she doesn’t care – it is just the right size, too. It was one of a bunch sent out here three years ago, so we felt very fortunate about that. Then there were a few pairs of roller skates – we got them each a pair. I bought two pairs of native dolls – they are made to order at the mission on Bahrain – they are authentic, but quite crude – something for them to keep. Also picked up a few things at the bazaar (Editor’s note: This is a reference to the event put on by the Dhahran Women’s Club in the fall of 1946) – some toys from Asmara – Eritrea – in Africa. Our tree was juniper sent by plane from Asmara – and quite pretty. Then a group of us got together several afternoons and mornings and made decorations for trees – and it is amazing what can be done when you have to. Actually, I don’t believe a child suffered from the fact they were a long way from home – (despite the fact that) so many do not have their household effects yet. There were parties and parties for grownups – from open houses to a kids’ party, which was worlds of fun. No one got any sleep and felt that the Season was really celebrated. Ken and I had open house for about 100 before the formal dance New Year’s Eve. It turned out to be a huge success and I am so glad we went ahead and did it. Everyone looked so pretty all dressed up and all seemed to enjoy themselves. The house did look pretty, too. That whole week was one of marvelous weather – we had heat on in the AC – it is reversible, you know – cold water in the summer and hot in the winter. We had been wearing winter suits and coats. But that week it was delightfully warm again and we spent lots of time on the beach. New Year’s Day a whole bunch were on the beach and several went swimming…today is still nice, but not so sunny and a little overcast. I am on the porch, though, in just a blouse and skirt writing this. School started again this morning, thank goodness. This business of three months in school and one off is fine. One month at a time is enough vacation for children out here, where they spend most of the time outside anyway! We are beginning to think about the way to take home – and have hopes of a tour through the Continent. It can be done now – I don’t know how nice the accommodations are – several have gone that way but we haven’t heard yet how it was. (Editor’s note: Europe was still recovering from the ruin and shortages of World War II, which ended only months earlier.) We want to do the Holy Land, then go across from Cairo by plane to Rome (you can’t go to Athens right now – but might by the time we go), up into Switzerland, on through Paris again and to London, and home by boat from there. The Company allowance won’t cover it, but we think it would be a shame not to see something while we have the chance. They allow us 28 days before our home leave starts and this trip can be done in that – of course, you can take as much of your home time as you want, but we wouldn’t want to use it all up on this side. We both want to do the South Pacific trip sometime – but it takes a very long time – Ken figures we had better trip on the way out for so often after you get home and it nears your time to return, they start hurrying you and we would probably fly back. All things being equal, we plan to come back for at least one more contract (30 months). We really would be foolish not to – Ken could never have hoped to get this salary in the States for years – if ever. He got another $80.00 raise for Christmas – and aside from the sad fact we are so far from our families, we all like it very much. We can stay for that next contract and Judy still will only be 13. It is a swell setup and Ken is in the groove. These fellows were lucky to get in on the beginning…and apparently Ken is on his way. At one of the Christmas parties, he was introduced to some men from Bahrain with, “This is the Texas Company prodigy, you know, but we like him just the same.” I don’t know what the score is now that the new deal with Socony has gone through – we may not go back to Dhahran. But even if we stay in this job here, it is fine. Ken is assistant to Bob King and Bob is the top man in Ras Tanura. Oh, well, it will all be okay. I’d just as soon live here as there – we are all settled in our house and it really is very nice. I love the beach, but like it down there, too (Dhahran) – so whichever is okay with me. Susan looks so much better since we came back here. She is out all the time – is brown again and has gained 2 ½ pounds. She gains by ounces and I guess always will be skinny like I was. She has really grown up so much lately. Judy just gains along normally and is a nice size – filled out, but not fat. The teacher wants to put her in the fourth grade and she is doing a lot of fourth grade work. I told them it was up to them if they thought she could do the work. That is the beauty of this sort of school – they can sort of advance at their own speed. We have two teachers now – a man and a woman – and 26 children altogether in the two rooms. I feel sure that over a period of years the children will come out ahead. They are missing some things – I would like them to have some dancing, just for poise and posture if not for anything else – but on the other hand they are getting a lot they couldn’t get at home, too. If we can work in all the trips we have planned, that alone will be an education. Ken has been playing the Roupee market in Bahrain – the exchange is up now and we have been doing very well on it. They want American money to buy American goods and the market has been fluctuating lately. The rate of exchange over here is three something – and there it has been up to $4.10 and they predict it will be up to $5. Ken has converted three good-sized checks from there and we have made our expenses – not bad! He plans to send over a $1,500 check this week and will make $750.00, if all goes well. It won’t last for long, though, as everyone is taking advantage of it. The ship that brought in the Christmas boxes also brought in reefer stuff, so we have been gorging on celery, apples, grapefruit, oranges, cabbage and some bananas. . . D’Souza did make a beautiful banana cream pie the other night. He still is our treasure and we hope to continue to keep him. I am reading Delta Wedding . . . it is interesting and different. I think the authoress hoped it would be another Gone with the Wind and it falls decidedly short of that – but good reading. I plan a buffet supper party on Ken’s birthday (January 31) but that is the only thing in the future I have on my mind. One more week and it will be ten months since we got here – doesn’t seem possible – in some ways, seems I have always been here; in others, seems like a few weeks. I’d better go along now – thanks ever so much for all the nice things – it was swell of you to go to all the trouble of getting them ready and so early – but believe me, it was grand to receive them. Hope you got the cable and that your holiday was all you hoped for. P.S. Did you know U.S.A. also means Union of South Africa? Several boys leaving this week to spend local leaves in South Africa. 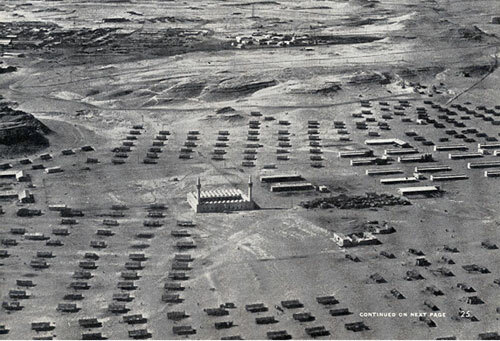 Ras Tanura dormitories and mosque – January 1947. Editor’s Note: Following are excerpts from “Dhahran 1947: Royal Visit,” an article written by the late William E. Mulligan for The Arabian Sun in April 1984. Because of the absence of Webster letters from January and February 1947, I thought the excerpts would help “fill in the blanks” about this historic occasion that touched the lives of all Aramcons living in the camps at that time – and which made international headlines. This section is illustrated with photos from a Life magazine article about the King’s visit – courtesy of my aunt, Judy Webster Bauer. 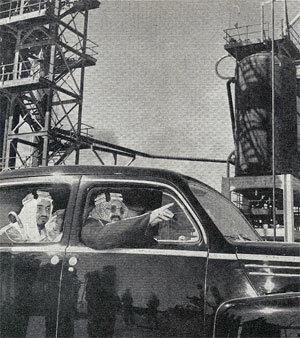 “In January 1947, Aramco played host to King ‘Abd al-‘Aziz Al Sa’ud for five tumultuous days. The aged King arrived in a fleet of six airplanes and was accompanied by four of his brothers, eight of his sons and most of the royal court. 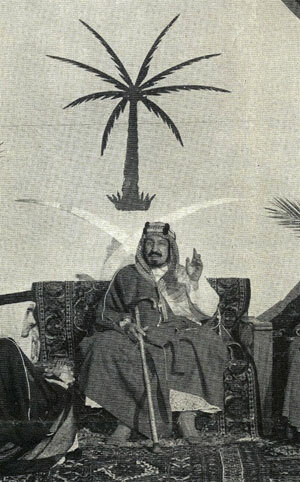 “On hand to greet the King, in addition to the entire Aramco community, was American Minister J. Rives Childs, resplendent in top hat, morning coat and striped trousers. The American press was represented not only by regular correspondents, but also by Life magazine and newsreel photographers. And on the third day of the visit, the Ruler of Bahrain and a large entourage came to call. “The journalists’ coverage of the King’s visit naturally drew attention to the tremendous oil wealth resulting from Aramco’s production of 200,000 barrels of oil a day. There were glowing references to the modern industrial town of Dhahran, complete with air conditioning. . .
“Dhahran was quite a boom town in 1947 . . . There were no families living as yet in Abqaiq. There were 45 children in Dhahran and 43 in Ras Tanura. The Sun and Flare, predecessor of The Arabian Sun, was a mimeographed publication . . .
visible here on the table beside His Majesty. “The King toured Aramco installations in Dhahran . . and in Ras Tanura . . . His visit to Ras Tanura was somewhat curtailed by the arrival that afternoon of the Shaykh of Bahrain. Among the gifts which the Ruler…brought the King were 14 mares, two stallions and 32 camels – prize winners all . 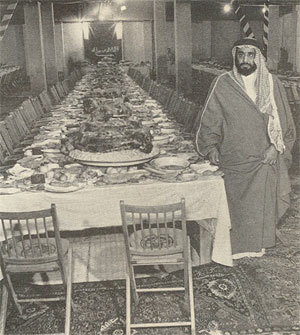 . .
“For lunch and dinner on the day the King entertained the Ruler of Bahrain, there were cooked 925 chickens, 320 sheep, and a number of camels. The meals were served under six large tents erected end-to-end. Bolts of white broadcloth were unrolled to provide one long tablecloth, 10 feet wide and 225 feet long. “One of the most agreeable events on the program was the audience the King granted the women and children of the Aramco community. The King was seated on a dais on the upper tennis courts . . . and he met and talked through an interpreter with each of the women, several of whom brought along babes in arms. It was a photographer’s dream situation, and David Douglas Duncan of Life obtained a marvelous picture over the King’s shoulder. In it the King was manifestly chuckling over the antics of the children assembled below him, where they were served, as was the King, cookies and grape juice. In conformity with local customs, the ladies were excluded from all other functions during the visit, so they relished their one opportunity to be with the King. . .
were not identified in the caption. “J. MacPherson, Aramco chief officer in residence at the time . . . said the whole company community, women and children and men of all nationalities shared the duties and pleasure of true hospitality. I seem to have gotten very much behind with my letter writing – but we haven’t heard from any of you for so long . . . Ken just brought a letter from Alice written February 16 -- (Editor’s note: This refers to Alice Jenner, Ken’s sister in Connecticut.) I can’t imagine where the mail is being held up – I got one a while back written January 16 – it was mailed by air and arrived boat mail – someone said all the planes were grounded in New York during January, due to weather conditions – maybe that is what held it up. I have a grand set of the pictures taken during his visit and will bring them home. About the trip home – we still don’t know and Ken is positive it can’t be until about June, so we will just have to wait and see. of Bahrain during the five-day royal visit. I went to Bahrain with Zoups (Fullmer) and three others from Dhahran last week – had a perfect trip. The last one was very rough, but this one was fine over and back. I got a few things. But even when we go on the fast launch and leave Khobar at 7:30 in the morning (meaning leaving Ras Tanura at least by 6) you still only have about three hours to shop, for we go with the radio man in order to be able to use the fast launch and have to come back at 12:30 with him. The suks close at 12:30 anyway, and reopen at 4:30 – that is too late to stay. By the time we get up to Aramco House, freshen up a bit and leave our wraps, etc., it takes time – especially with a group. We usually split up and even so you are dashing hither and yon and seldom get much done. hangs on a wall in her Seattle home. 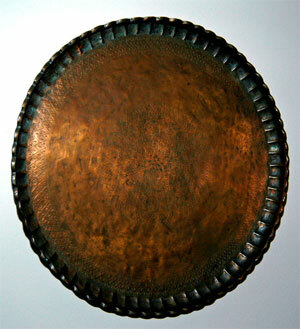 I did buy an old copper tray – filthy and a little bent, but just exactly what I have been looking for ever since I got here – to make a table out of. It is the kind they pile up with rice and a hunk of sheep. It has a pie crust edge and I am sure is going to be lovely when fixed. (Also) got a little silk material from China and two old brass khol jars – they are about three inches tall and have a stopper…like a perfume bottle, and were used to keep their khol – or mascara – in. Also, another one of the same sort that is a brass fish – that someone would like at home for a novelty. Bought some oatmeal – we have been out for ages – some California canned lemon juice and some cans of parmesan cheese. Also three packages of Madras curry for D’Souza and Chutney from Bombay – some paper napkins for a big tea Pauline King, two others and I are giving this next week. There are some 60 women here now and we will ask all the nurses and stenos, too – get them all in and over with at once. The weekend was positively hectic. We were invited to a cocktail buffet from two till four – before the dance that started at four. We didn’t get there on time and just as well – it was a lulu – dropped in … for a few dances then drove to Dhahran for our big anniversary party. (Editor’s note: this was to celebrate the first anniversary of all March 1946 arrivals in the camps.) (H)ad a cocktail party there then we all went to the special dinner prepared at the mess hall (after it was closed to the public) – had a grand fried chicken dinner and a huge cake with Nursery Special on the icing – then on to the dance there for a while – on back to Fullmers’ for singing and just visiting – and drinks, of course. Ken had to come back that night, so I came with him at 1 o’clock, leaving both children there for the night. I drove back down there the next morning with friends and went to the Scout and Brownie Investiture, which was that afternoon – it was a lovely program and the first for the Arabian Scouts, so quite an event. They had a big tea afterwards then I came back home with all the other Ras Tanura people on the bus – a long and tiresome trip. I was completely pooped when we got home. Last night, three of the girls went together and had a big picnic on the beach – way up from here for a couple visiting from Bahrain – we had a huge bonfire – scads to eat – baked ham, baked beans, hot rolls, all sorts of cookies and relishes – and beer! Later we came back in to one of the houses where there is a piano and danced – but we came home early. Ken had spent the day in Dhahran and was tired, and I had had enough, too . . . I am having 15 in for tea this afternoon. . . D’Souza has the house all slicked up and all the brass polished – he is such a good guy, now that we got our little troubles settled. I came so near firing him about two weeks ago it wasn’t funny – even though I knew I would be sunk without him. I couldn’t put up with his actions at that time, but apparently it was all a misunderstanding. He says he will work for us as long as we are in Arabia – but you can’t be too sure of that. They really are quite temperamental, but I can overlook a lot in him for he is so good in all other ways. I have been trying to get some sewing done before it gets hot, but find it hard to get around to it…if we come by boat as we hope (on Home Leave) we will need quite a few changes of every day clothes. The girls are out of shoes – but one of the women is in Asmara now and I have ordered sandals for them from there – also for myself. They are Italian and quite pretty, but you have to have them made. That is where they make the most beautiful leather bags of reptile – and you can have shoes made to match. But I am afraid of having regular shoes made – at $20.00 per without being there to try them on. I have a lovely bag and this same woman is going to bring the skins to match so I can have some shoes made at home. The bag is small-grained red lizard. Ken got it for me – it is lined with grey suede . . . if any of you think you would like one, we can order from there whenever the plane is going over. They aren’t cheap, but are much cheaper than reptile bags in the States and they are so beautifully made. They run around $30.00 up – and as I remember when I was leaving, a real reptile leather bag was about $125.00 . . . Asmara also has beautiful antique silver that turns up once in a while – and china. I’d love to go over there, but as with every other place from here, it is expensive to go – the plane fare per is $265.00. By the time you transport four and stay in a hotel for a couple of weeks and buy some things it would be a rather high holiday. . . A lot of the men go there on local leave – and no doubt we will get there eventually – You have to fly, but go through Jedda on the Red Sea, which I would like to see. We have decided to not try and make the Holy Land and Continent trip this time – conditions aren’t too good and you can’t even go to some of the places in the Holy Land. Guess we will have to make the next contract – as it looks now the best bet is to go to Cairo and take a President Line out of Alexandria or Port Said and go right across the Atlantic. They make a couple of stops – Naples, for one. The luxury lines and itineraries just aren’t what you would really want yet – especially traveling with children. You can take chances for yourself, but not for them. You have probably read by now that we have a new president of Arabian American Oil Co. – Bill Moore – a Texas Company man. He was out here last summer and I met him at parties a couple of times. He is quite young, around 45 – not bad. They have some stupendous things in the planning for here – sounds like Arabian Nights! I am still struggling with my Arabic – and I mean struggling! The trouble is that I don’t get the time and take the time to study properly – and you really have to. But seems something is always coming up just at the time I want to study. About half of the class went on this picnic Saturday night instead of going to class. Not so hot, but was the only time they could work in the picnic, too. So there you are. I guess I really shouldn’t have started it – but do want to get at least a little of it. So far, as with any other language I have had, I get the gist of it and can read and understand some, but have a hard time saying it. I haven’t anyone to practice on. D’Souza knows just a smattering of it and doesn’t STOOP to speaking it. They (the servants from India) hate the Arabs and everything about them – it is mutual. Did I tell you the girls did very well with their report cards? Susan got all S’s – so did Judy, except for an S plus in Reading, Arithmetic and Spelling. They have moved her up into the fourth grade and so far she seems to be doing OK. The work is harder and that is better for her. I must close now – the end of my four pages – we have postage rates now to send one, two, three and four pages, so that helps somewhat. Keep writing, even if they are late in getting here – it sure is swell to get letters. I actually was amazed when someone delivered an invitation a while ago to discover that Easter is right upon us. I had no idea it was so soon! St. Patrick’s Day came and went and I didn’t even know that, either. Just goes to show you, this business of Thursday and Friday being Saturday and Sunday is sort of confusing, but no more than a lot of other things out here! We are moving again! I shouldn’t be so surprised, but when they sent us up here only temporarily for a few months I just crossed it off as a lot of bunk – for it so seldom works out that way – but just the same we are to go back to Dhahran – permanently. Ken has a new job – and a new title. He is Assistant Manager of the new Dept. of Construction – to have charge of all construction, engineering and communications for all of Aramco in Arabia – with Bill Cooper as Manager. It is a honey of a job, but a very big one. Ken will be busy all the time and so, of course, not at home as much, but that is the way it goes. He is delighted and this is the big change he was told about some time ago. I mean that there would be a big change and that his new job would be that – then things got sort of snarled up and it was put off till now. The Coopers are leaving Saturday morning for America by plane – on a homy, homy home leave – and Ken will move to Dhahran Saturday to take over in his absence. I won’t go till school is out the 8th of April for their (the kids’) vacation period. We will have the house assigned to us before but there was a family in it for several months and they will redecorate it for us – that will take a little time, too. Ken thinks I should stay here till school starts in May, but I don’t see having him eat in the mess hall there all the time. The children enjoy the pool down there as much as the beach up here – and can do more swimming there. So I think I shall go after school is out. We are hoping that when Bill gets back we will be able to go on our home leave. But there is still the problem of relieving Bob King up there while he goes on his – and if they send Bill up here to relieve Bob, Ken will have to stay. I guess it is something to be included in the top five who have to be spread out to “take over” but will (interfere) with our home leave. It can’t be helped, though. Ken is in a position now where he will have to take the inconvenience of the rest, too. It may work out and we’ll surely let you know the minute we know. I do think Ken needs a change and a rest from this, but as far as I am concerned, I can make out. If our leave is thrown so late – into October, say – we won’t come until next spring, for I won’t bring the children into cold weather from here and run any chances, as much fun as it would be to get home and see everyone. There will be a lot of changes around here. So many are packing to go home how and several will not return. Their children are too old or in the case of two of the doctors, whey want to go home and set up their own practice. I sure hate to lose the Floods and Phelps. They are both excellent doctors and Phelps is a wonderful surgeon. You can’t blame them, though – they have their own life to plan out. 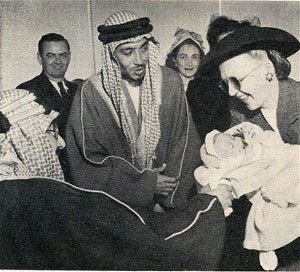 Oh, yes, I almost forgot to tell you – Yemkin arrived and it is a little girl named Jane Elizabeth Crampton– the first white child to be born in Ras Tanura. It really was a funny time. Pauline King, Ros Crampton, Ruth Cundall and I were giving this big tea last Saturday and we had been teasing Ros, telling her a sure way to get things started was to give a party and Yemkin would be sure to make his appearance the next day. But she went to the hospital that morning and Jane was born before noon – so we had a big topic of conversation at the tea and everyone was so happy for them. One of the artists here made us a big announcement and we put it up on the mirror over the fireplace in the Kings’ house. The morning the baby was born, little Rickie Flood got into some Nembutal tablets and ate six – so they had him down pumping out his tummy while his Daddy (Dr. Flood) was delivering the baby – some fun! They couldn’t figure out what was the matter with him at first – he got dopier and dopier and couldn’t walk. Then his mother discovered the tablets gone. The tea was a huge success, even if we did have over 73 women. We invited them in groups and had it from 3 to 6. With these good houseboys it was a snap. We didn’t even have to go near the kitchen, actually. They kept things going beautifully and the tea table did look pretty. We were fortunate in getting some flowers from Dhahran and I fixed a nice center arrangement. All the food was good and it went like clock work. I am so glad helped give it and it is over. Otherwise, I would have to give some sort of a thing before I left. Kings are giving a party for us Sat. night as well as (for) another of the men who is going to Dhahran to live. There are a lot of farewell parties going on with all these people going home. So I can see it is going to be quite a time. I sure hate to think of moving again – and surely hope Ken can find out whether we can go home in June before we do move so I will know that to keep packed up, etc., because it will all have to be packed up again, when we leave. I have made two dresses this week – the white islet and a seersucker suit – hopeful that I will use them on a boat. Susan just came in from a picnic. One of the women took a group of the smaller children down to the terminal for the morning and lunch. Judy went on a wiener roast at the beach yesterday with the Brownie group. Ken should be in any minute and will want to get in a little time at the beach, so I had better get myself busy around here. It is a beautiful day – and the water is heavenly looking. Sure will miss seeing it all the time. The air is so fresh and clean up here. The masthead of one of the early Arabian Sun and Flare newspapers, now known as The Arabian Sun. 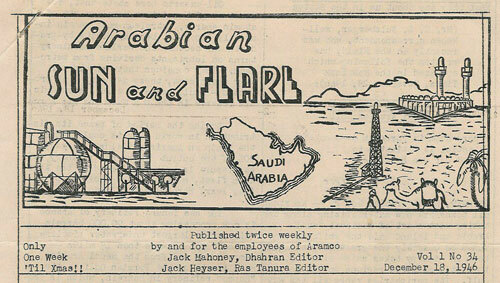 In Aramco’s infancy, it was a mimeographed publication. This masthead is labeled, “Volume 1, No. 34” and dated December 18, 1946.